This Murano Oval Glass beads- Blue- Contains Miraculous Medal and Crucifix features our satisfaction guarantee. Imported from Italy. 1-1/16" Sterling Silver Portrayal of St. Anthony holding the Child Jesus. He is the Patron Saint of Lost Articles, Oppressed. This Sterling Silver Oval Shaped St. Anthony Medal is made in the USA. This Our Lady of Kibeho Tiny Saint charm can be clipped on to apparel, backpacks, necklaces, bracelets, keychains and anything you can imagine! About the size of a penny, it's made of soft, rubbery PVC and is super-durable. For anyone with a devotion to Our Lady of Kibeho, this Tiny Saint charm makes a fun religious gift for any occasion. The packaging even features a biography and information about the devotion. 3'' Soft Neoprene Confirmation Rosary Pouch. 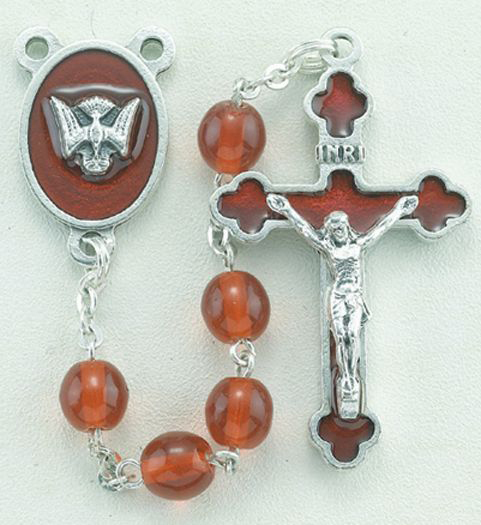 This Red Rosary Case with Confirmation Symbol Gold Stamped features the CatholicShop.com money-back guarantee. Light Sapphire Crystal Bead Brac 5.5"
5.5" 5mm Light Sapphire Crystal Bead Rosary Bracelet (Boxed). This Light Sapphire Crystal Bead Brac 5.5" features the CatholicShop.com money-back guarantee. Get 25 pieces for one low bulk price with our 25-Pack of Prayer For Light - Holy Spirit Holy Card. Only available in this bulk pack. Prayer for Light Clear, laminated Italian holy cards with Gold Accents. Features World Famous Fratelli-Bonella Artwork. 2.5'' x 4.5'' 25 Per Pack.